Blog › Information › Fireguards…Who needs them?…You do! We all need our homes to be warm and safe throughout the year. Obviously Winter is the most important season of the year to ward off those plunging freezing temperatures. Many homes have open fires that heat exclusively or supplement other forms of heating. Open fires come with a health and safety warning, though. Sparks and burning embers can jump out of the open fireplace, without warning. Store logs away from burners because radiated heat can cause them to burn." Open fires can cause death and destruction when fire gets out of control or correct fire precautions are not adhered to. Read this terrible story of a poor woman and her pet dog, who died in a house fire in Lichfield, Staffordshire. The fire had started in the dining room after a spark from her coal fire fell onto a nearby armchair. A woman died alongside her pet dog in a blaze at her home, an inquest heard. To prevent tragedies of this and other types, please download this free leaflet, to conduct your own risk assessment of your home. Do you have a fireguard for your open fire or heater? If not, please take a look at the extensive range of fireguards at Brilliant Wall Art. You know it makes sense. They can be elaborately decorated, such as our bird leaf scroll fold fire screen spark guard. 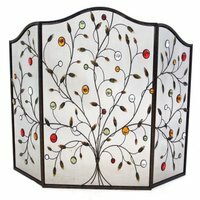 Or our fabulously decorated jewel encrusted three fold fire screen spark guard. The Brilliant Wall Art fireplace accessories feature essential items, which you may require beside any fireplace, ensuring the perfect fire is maintained and safe. Our popular accessories include, our fire poker tools and our classic open fireplace bellows, to easily start a warm fire. With the majority of our fireside accessories on special offer at the moment, you will be spoilt for choice on the best companion set or cast iron log basket to buy. If one of our fireside accessories catches your eye and you would like to find out more about it, please contact us today.